On 24th March, St John's Church in Brigg was filled with people saying their fond farewells to John Alcock, former pupil of BGS, long-time science teacher then senior teacher at Sir John Nelthorpe School and well-known local sportsman. Read more on Nigel Fisher's Brigg blog. John's self-penned introduction in the 2008 edition of the Briggensians Newsletter and the report of his speech in the 2009 edition offer a good summary of his links with and contribution to the School and a sample of his dry humour. It was announced earlier this month that Ann Nelthorpe, sister of the late Col. R.S. Nelthorpe, had died peacefully in Rathside Residential Home, Scawby. I had my annual Christmas card from Norman Worth and he said that Audrey Worth had died. She was school secretary in Mr Williams's time. Our paths crossed again when she was secretary at St Hugh's Prep School Faringdon where I was teaching in the 1980s, and we have kept in touch since, although I am retired and back in Lincolnshire now. The Right Rev Eric Waldram Kemp, priest, canon law expert and theologian, former Bishop of Chichester, died on November 28, 2009, aged 94. Any estimate of him that failed to take account of his birth and upbringing outside Grimsby, and his education at Brigg grammar school, would miss the basic influences that made him what he was. Moreover it was in his sixth form history lessons that he first became interested in the Anglo-Catholic Oxford movement of the Victorian era. Dr Kemp, Bishop of Chichester from 1974 to 2001, was appointed just before the Church of England brought in a rule requiring bishops to retire at 70, declined to bow to the spirit of the new regulation and so became the longest serving diocesan bishop of modern times. In addition he was one of the leading Anglo-Catholics of his generation and for many years an influential figure in the Church. Eric Kemp was educated at Brigg Grammar School and Exeter College, Oxford, graduating with the degree of Bachelor of Arts in 1936. He trained for ordination at St Stephen's House, Oxford from 1936-39, was ordained deacon in 1939 and priest in 1940. After serving as a curate in Hampshire he returned to Oxford, where he spent the next 30 years, first as Priest Librarian of Pusey House, Oxford (1941-46) and Chaplain of Christ Church, Oxford (1943-46) and then as Fellow, Tutor and Chaplain of Exeter College, Oxford from 1946-69, where he completed his doctorate in Divinity, adding to the Bachelor of Divinity degree obtained in 1941. He was Dean of Worcester from 1969-74, where he did good work opening the Cathedral to the city and community at large, prior to his elevation to the see of Chichester. He had also been a Chaplain to the Queen (1967-69) and Canon and Prebendary of Lincoln Cathedral (1952-2001). Eric Kemp was one of the leading scholars of ecclesiastical law and a former member of the Court of Ecclesiastical Causes Reserved. In 1998 a volume of essays on English Canon Law was published in his honour. He was elected a Fellow of the Royal Historical Society in 1951 and also received an honourary DLitt from the University of Sussex. Within the Church of England Dr Kemp was associated with a conservative viewpoint. He was, as his Times obituary stated, "at the heart of opposition to women’s ordination", though in his administration of his diocese he was even-handed, trusted and fair . In 1999 he was one of only four bishops in the United Kingdom who declined to sign the Cambridge Accord, an attempt to reach agreement on the human rights of homosexual people within the Anglican communion. However he had special concern for homeless people and those suffering with HIV and Aids. Despite his position as a leading Anglo-Catholic, Eric Kemp was involved in conversations with the Methodist Church during the 1960s and early 1970s about a proposed reunion with the Church of England and he strongly backed the plan, which eventually failed. Ecumenism remained a strong interest and in 1998 he was made an Honorary Canon of Chartres Cathedral. In 1994 Dr Kemp became President of the National Liberal Club. 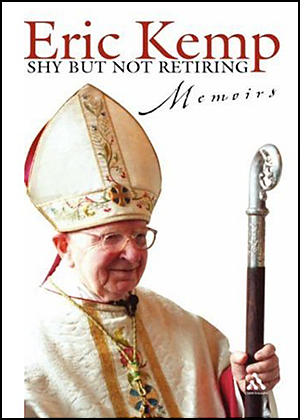 After retirement Eric Kemp remained in Chichester and in 2006 published his autobiography with the title "Shy but not Retiring", which revealed his human side and his social commitment. In 1953 he was married to Patricia Kirk, a daughter of the Bishop of Oxford. He is survived by his wife and their son and four daughters. Many thanks to Rev. Colin Lingard for drawing this to our attention. We have received an article from Chris Plumtree (1958-1965) detailing the advantages of this scheme approved by the UK tax authorities for those planning for retirement who either live outside the UK or wish to consider doing so after they retire. Chris has made use of these regulations himself and also helped relatives and friends to do the same. Of course the Briggensians Association cannot endorse any particular financial advice or adviser but we are happy to provide a link to the article Chris has sent in so that overseas residents can read and decide for themselves. Thanks to Chris for sending this in. Details of how to contact Chris are in the article.